There are no one-trick ponies in the Nourish Food Marketing stable. We’ve each got our thing that keeps us busy when we’re not at work – our “side dishes” if you will. In this installment of Side Dishes, we’re catching up with our Art Director - at least we’re trying to! 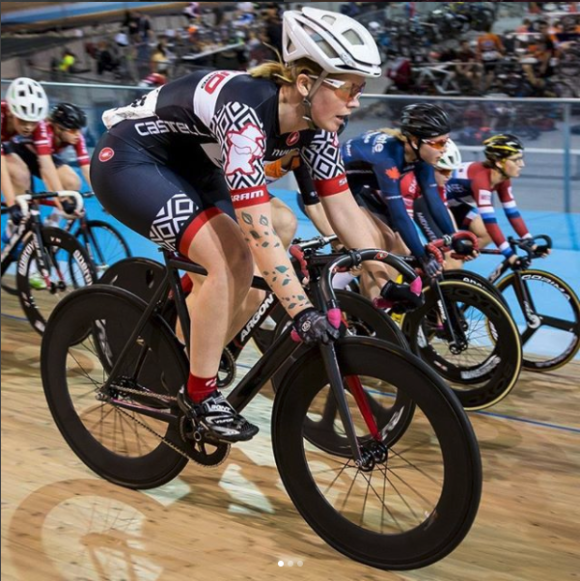 Molly started racing in the Ontario Cup Road Cycling series three years ago. She rose quickly to the top amateur category and is often seen in the top ten, or on the podium. Molly always gives the full-time racers a run for their money. She’s also heavily involved in the Toronto cycling community. Molly served as VP of Recreation for the Dark Horse Flyers Cycling Club in 2016, and Race Director for Bikes on Wheels in 2017. Currently, she's working on establishing an Elite women’s trade team for 2018 with sponsorship from Garneau Canada, Skratch Labs, and Mercedes-Benz. She’ll be volunteering as a coach as part of Midweek Cycling’s ‘Learn to Race’ program starting in April. All this, plus she's taking part in an initiative to build the female side of the sport. On average, she rides around 200 km a week for training and racing through the warm months. In the winter she moves indoors to the Mattamy National Cycling Center in Milton. Built for the 2015 Pan Am games, the world-class velodrome is home to some of the best cyclists on Earth. All of this hard work obviously requires fuel! Molly’s focus when it comes to nutrition is carbs, carbs, carbs. She feels too many publications only provide advice for male athletes. Diets like Keto can be dangerous for women if they’re not adapted to their specific needs. Her go-to post workout is the French Vanilla recovery product from Skratch, alongside a good artichoke and zucchini pizza, rice bowls, and sushi. During rides, she chooses jerky because she favours salt over sugar, and most widely available endurance gels are high-sugar formulations designed for men. For races, Endurance Tap is the way to go. From the track to the streets, Molly takes her cycling seriously. But, when the race is over, there’s always a smile on her face. We couldn’t be happier to have her on Team Nourish!